The capturing of incoming documents and forms can be an expensive and time consuming challenge. Ephesoft helps you cope with this problem by automatically capturing content that is vital to your business. Ephesoft’s Smart Capture® automates and streamlines your business processes by transforming incoming documents and forms into actionable information. The accurate extraction and quick delivery of this data into core business applications and processes increases processing speed, enhances data quality and helps you significantly reduce manual data entry costs. In today’s complex businesses and public agencies, it is important to keep an eye on the overall process. The impact of document capture systems to the business can be tremendous, but it is important to understand how the capture system integrates with other back office platforms. The crucial question at this point is: What happens with the information after Ephesoft has delivered it? It is important to ensure that the data is picked up quickly and above all that it is adapted to the needs of the specific target groups. Therefore, the captured data needs to be integrated into other applications (e.g. see image 1). Let us get a little more specific with an example: it-novum’s Accounts Payable Template–a solution based on Alfresco that is fully integrated with Ephesoft and SAP. 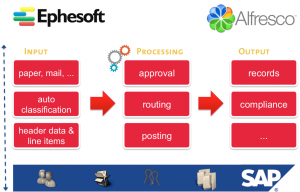 Ephesoft streamlines the document capture process and reduces manual data entry. This eliminates lost invoices, lack of transparency and long invoice cycle times. After Ephesoft has done its job, the invoice needs to be processed. This is where Alfresco, a smart enterprise content management system, and our Accounts Payable Template come in (see image 2). Ephesoft uploads an invoice self-controlled in the Alfresco repository and the Activiti process (workflow) engine picks up the documents. The invoice undergoes a customizable approval process that uses extracted information and organizational data from SAP for identifying the correct assignees based on limits and cost center responsibilities. After that the invoice is automatically posted and filed compliant to the companies and legal rules. SAP is seamlessly integrated throughout the process. Ephesoft uses SAP master data to identify the supplier based on extracted data and Alfresco synchronizes the matching order data and further information. In addition to that, Alfresco is able to post invoices and communicate with user SAP GUIs. Linking SAP to Ephesoft and Alfresco leads to faster processing, improved accuracy, better control and lower transaction costs in general. This allows you to streamline your business processes and to support green policies by using less paper. However, the ITN SAP Integration Suite that works at the back of the stage is not tailored to AP scenarios; it utilizes the official SAP Business API (BAPI) to support a variety of use cases. It is also possible to use the integrated SAP Content Server component. The ArchiveLink (ITN SAP Content Server) implementation enables companies to file almost all SAP documents inside Alfresco.